I came home from work one evening last week and immediately noticed something felt off. Somehow it seemed quieter than it has this winter and weirdly still. Patrick was working from home that day and I asked him right away if it seemed odd to him. He hadn’t noticed anything, but as I moved into the bedroom to get changed out of my work clothes I knew it felt chillier than usual. Checking the thermostat I saw that although it was set to 69, it was only 68 in the house and the heat was definitely not on to rectify. 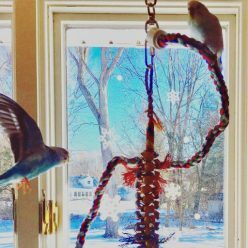 Not only did fixing the issue become a top priority, but also keeping the parakeets warm knowing the house was going to get colder. Admitting that I let something slide is a little difficult for me, but here’s the thing, I had considered two possible system failures. One, the power goes out, but in spring summer or fall, in which case I have my Power Failure Lights and I’m ready to get the budgies safely back in their cages to ride it out. Two, there’s a major storm and the power and heat are both out, in which case we decamp to my mom’s house because they have this glorious Generac Generator that runs everything. I felt pretty unprepared for just the heat going out on its own, which is not really enough of an emergency to deal with the hassle of moving all of the birds, especially with Kevin in quarantine. The most embarrassing part is that even though I tell people all the time that a Heating Pad is an essential part of a parakeet first aid kit, I don’t even own one myself! I know, that’s seriously just horrible and I shouldn’t even admit it. I’m ordering one today, swear. 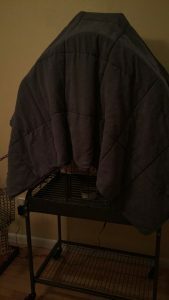 On the plus side, Kevin already had a K&H Snuggle Up Bird Warmer in his cage because we were worried about him getting cold. I love this bird warmer, this is the second winter we’ve used it and have had zero issues. It’s just consistently warm. Similarly, Kelly has the K&H Thermo-Perch , which I also do not hesitate to endorse and have found to be very safe and reliable for the second winter running. Toby is terrified to sit on the heated perch, but I’ve caught Kelly there on several occasions. Just make sure to get the textured version, the smooth one makes it very difficult for parakeets to get traction. I quickly rang up the furnace people and they had a technician deployed right away, which was great, although I don’t love the after hours fees so much! We put Toby and Kelly both in Kelly’s cage, which is cause for a ton of squabbling but in a pinch I figured they could help warm each other up. 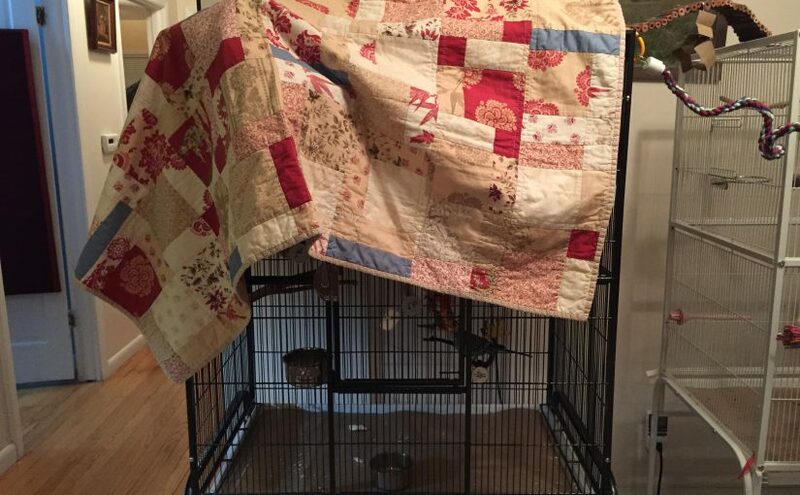 Both cages were covered with whatever blankets we had around the house. I don’t cover at night because Toby has night frights and doesn’t tolerate being covered anyway. In general, we find that they sleep perfectly well uncovered, and typically I don’t have to worry about drafts so there’s no concern there. Keeping the heat at a steady 69 has worked very well for us for a few winters now. The furnace guy showed up in about an hour and quickly diagnosed the issue as a broken thermostat, which I wouldn’t have even considered as an option! By the time he got the heat going again we had dropped down to 64 and I was so grateful to have it resolved quickly that I decided not to have a heart attack over the unexpected expense so close to Christmas. No one was any the worse for wear, and as the repair man was leaving my mom called to tell me she was about to bring over her EdenPURE Heater . Obviously I should both always call my mom before a repair man and buy my own space heater. I got really lucky this time that I knew the furnace wasn’t working right after it happened, and that the repair man was able to come out so quickly. If we were in the middle of a snow or ice storm I couldn’t always expect that quick resolution. Not to mention what would happen if they had to order a part. Without beating myself up too much, I need to take this as a warning to be better prepared. 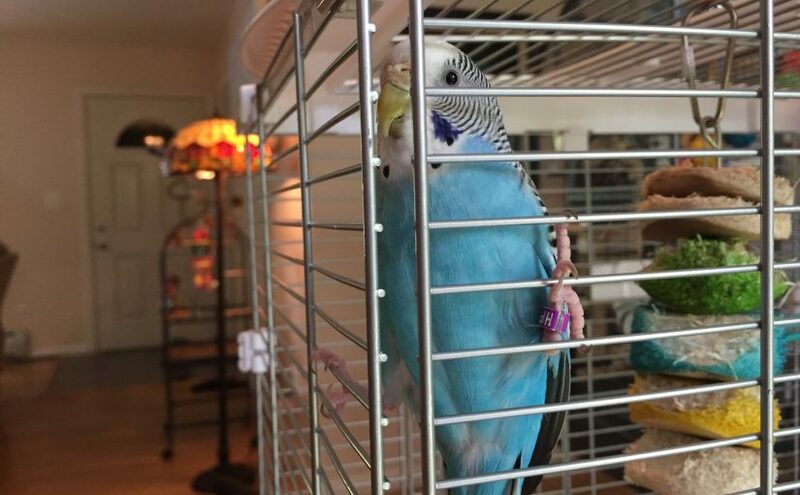 Clipping a parakeet’s nails – an exercise in futility? In this household we’ve tended to subscribe to the theory that a parakeet with an adequate variety of properly-surfaced perches should not need any human intervention with keeping their nails trimmed. 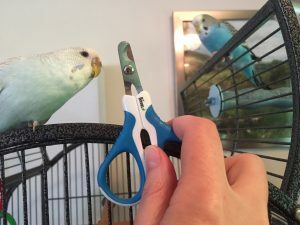 Recently we’ve taken notice that Toby and Kelly have lost interest in their own nail maintenance, and it might be time to face the specter of clipping a parakeet’s nails. 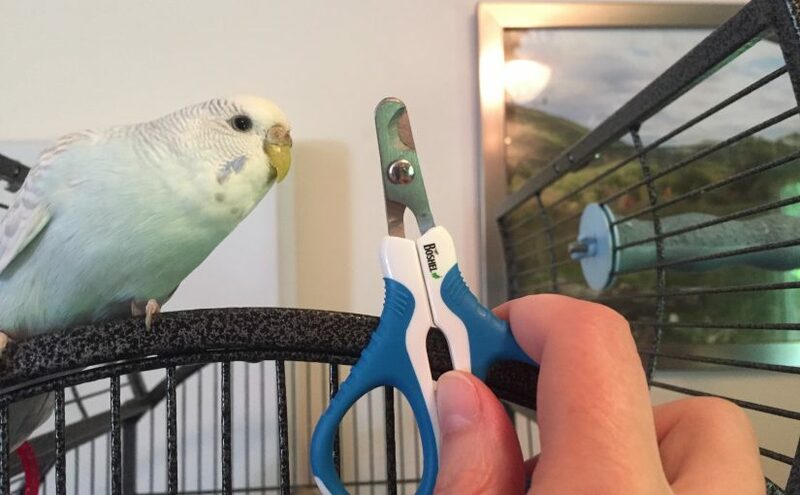 When I was putting together our first aid kit for the parakeets I included a set of Nail Clippers Scissors , they can be used for any small animal , but birds are on the list, and it does seem like it would be easier to clip with that than a traditional human nail clipper. 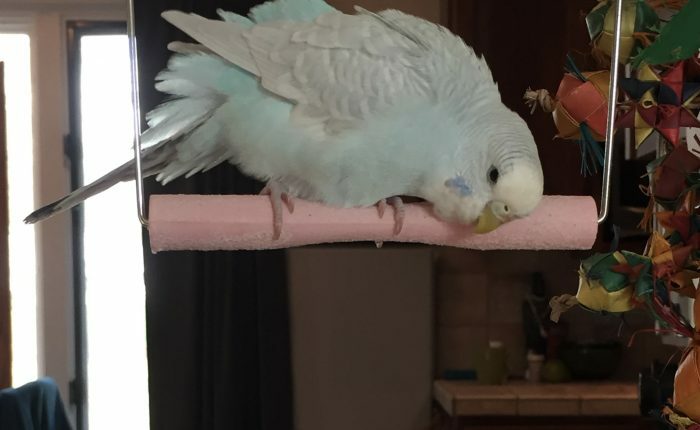 I also did my due diligence research on how to towel a small bird to keep it still, and to make sure never to cut too high up on the nail because you can hit the blood vessel. If you do hit the blood vessel you want to have Styptic Powder or at least Corn Starch on hand to help stop the bleeding. Parakeets can bleed out pretty quickly, so getting a handle on any bleeding is important. So, theoretically it seems possible to trim their nails, if not like a great time. Over the past year I’ve gone through phases of trying to get them comfortable with the appearance of the scissors so they aren’t a scary item, and they are always intrigued by them instead of frightened. This may sound crazy but we’ve also periodically made a big show of clipping our own nails in front of them and filing our nails. The parakeets always get very excited by this process and are eager to jump onto our hands and inspect what we are doing. Of course this didn’t translate at all to our cutting their nails, and every time we approach them with the nail scissors they act like we have lost our minds. Seriously, they are not even scared they are deeply offended and completely unwilling. Patrick was very sneaky one day and managed to trim a single nail of Kelly’s by distracting her while she was perching and putting the scissors up behind her. That’s really the sort of trick you only get to use once before they are wise to it! This past weekend we decided to give it a real try. I got out a cloth napkin and we managed to gently burrito Kelly in it; we did also try for Toby but that was not happening. Although Toby and Kelly like us and consider us part of their flock, they aren’t particularly tame. 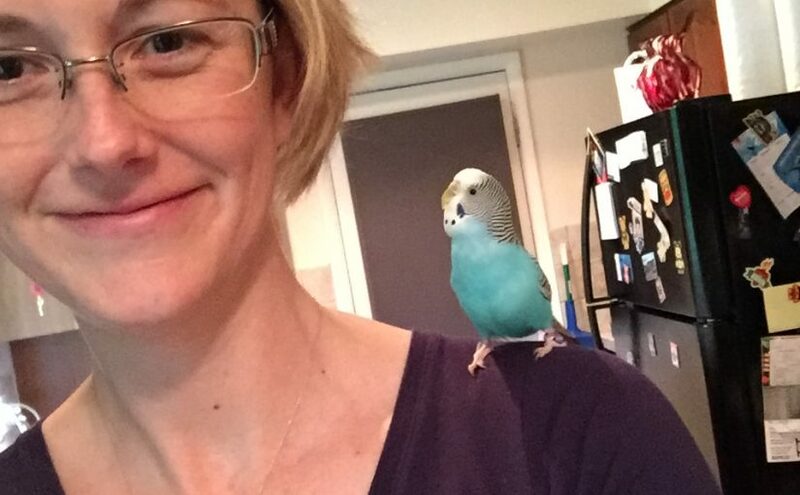 We don’t really try to teach them any “tricks” and they are not the kind of parakeets to enjoy a snuggle. At any rate, we had our little Kelly burrito and the nail scissors, but she was wriggling like a fish, her tiny feet were bicycling like mad and to top it all off since we were acting on the spur of the moment, Toby was trying to jump on Kelly’s head to figure out what the heck was going on. It was a total disaster. There was no way to safely cut anything in the midst of all that ridiculousness and we let Kelly go in short order. I know this is horrid but we haven’t tried again. Thus far they can still walk properly on flat surfaces and they aren’t getting stuck in any toys or on our clothing. We are keeping a close eye on the situation, but I think we’re going to continue with the wait and see, and hope that they pick up the ball again on their own nail maintenance! we see the scissors and we are not afraid! Posted on July 11, 2017 July 10, 2017 Categories Budgie Tips and TricksTags basics, beginner mistakes, enrichment, health, morons, nails, necessities, parakeet health, parakeet mistakes1 Comment on Clipping a parakeet’s nails – an exercise in futility?